Adeniums, commonly known as Karoo Rose, Desert Rose, or Impala Lily, are another member of the Apocynaceae (Dogbane family), they originate in the hot dry regions of Africa, the southern edge of the Arabian Peninsula and the island of Socotra. 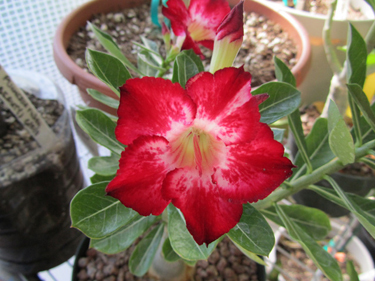 Different varieties of Adenium are similar in that they all produce attractive flowers and also usually produce a fat stem near the base (the caudex). However, although they all have beautiful flowers and fat/interesting stems, there is endless variation in these traits and little agreement amongst plant-lovers on which is the best! Adeniums in general are well adapted to the hot dry conditions of central and southern Arizona from March through October, but have essentially no frost tolerance, so must be protected whenever cold temperatures are expected. Because winter protection is required, Adeniums are almost always planted in containers, and moved when necessary to provide protection. As for all plants in containers, more attention is necessary than for plants in the ground. In containers, soil conditions change very quickly - soil in containers heats up and cools down much faster than does native soil; also, soil water content changes much more quickly in containers. Adeniums come from tropical regions near the equator and other desert regions where light intensity is similar to that of the Sonoran Desert. Where native, Adeniums can grow in full sunlight, and if properly managed, they will also tolerate the full sun of southern Arizona. However, here in the southwest, since we protect our plants in the winter by placing them under artificially warm conditions and under much lower light levels than exist outdoors, we cannot immediately place our plants in direct sun in the spring - they must be gradually adapted to higher light, and will likely do best if maintained under partial shade throughout the summer (20-40%). Exposure to full sunlight from noon to 5:00 PM in mid-summer can be especially dangerous. Under shade, leaves will be darker green and likely experience less damage from wind. Flower production may suffer if excessive shade is used. 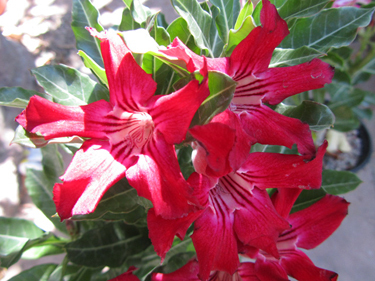 Adenium can tolerate whatever high temperatures we are likely to experience outdoors in the Southwestern U.S. When temperatures are very high, special care should be taken to avoid excessive exposure to direct sun, especially in the afternoon, and watering should be monitored very carefully. Probably the most important thing to remember is that Adeniums are basically tropical plants - they occur naturally in a subtropical semi-arid climate where frost essentially never occurs and where low temperatures (below 50F) are uncommon. Long term exposure to frost can kill your plant, and even extended exposure to temperatures below 40F can do the same. If temperatures below the mid-40's are projected, plants should be moved to the protection of a covered patio or inside. Otherwise you are taking a great risk of killing or at least severely damaging your plant. Effects of cool weather are much worse when soil is moist; i.e., in late fall, soil should be allowed to dry out and protected from rain during cool spells. 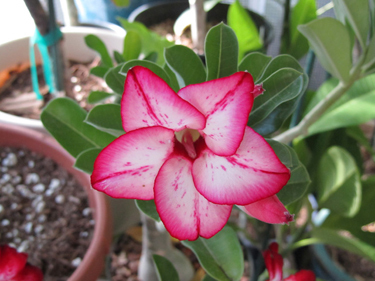 Most Adenium varieties will tolerate soil temperatures of 40F and somewhat below if the soil is dry. Along with reducing watering to increase cold tolerance, fertilization should be ended in late August or early September. Availability of nutrients (especially nitrogen) encourages the plants to remain active and produce new growth. Actively growing plants are much more susceptible to cold damage. During the active-growing season (late-May through early September), application of a complete liquid fertilizer (one which contains nitrogen, phosphorus and potassium) once or twice a month, or use of a controlled (slow) release fertilizer at the rates recommended on the package will satisfy nutritional needs. Slow-release fertilizers should not be applied after mid-summer. Proper watering is the key to keeping your Adenium healthy. Because every situation is unique, it is impossible to give a precise watering schedule that will lead to best results, but a few guide-lines will be given. Frequency of watering is determined by the soil mix and container which you use. A well-drained 'cactus' soil mix should be used to avoid excessive moisture around the roots, but such mixes will require more frequent watering. Plants in unglazed terra cotta containers will need to be watered more frequently than plants in glazed or plastic containers. Care should be taken to assure that drainage holes in the container are not blocked. During the active growing season - for plants in situations where they receive direct-light or only partial shade during most of the day - watering 2 to 3 times per week should give good results. The plants will survive with much less - as little as once or twice a month. During the hot growing season, at each watering, apply enough water to saturate the soil and to allow a small amount to leach through. In addition to providing the maximum water charge to the soil, this will help to avoid salt build-up (a small amount of salt will be removed with any water which leaches through). Saturating the soil at each watering will also prevent peat-based media from developing dry spots. Peat has the strange characteristic that once it is thoroughly dry, it strongly resists re-wetting. Adding a few drops of liquid detergent to a gallon of water before using it to irrigate your plants can help over-come this problem if it occurs. Cover the surface of the soil with a gravel mulch. This usually results in a more appealing appearance, but more importantly, it reduces water loss from the soil. Beginning in early to mid-September, watering frequency should be gradually decreased; soil should be allowed to dry between waterings to cause plants to begin to 'harden' for the upcoming winter. From late October to the end of winter, plants should be treated as a rot-prone cactus. Watering should be infrequent and light; as little once per month, and only moisten the top 1/4 to 1/2 of the soil. Adeniums respond well to pruning if it is done during the spring/summer growing season. Usually pruning is done to reduce overall plant size, or to selectively remove branches to 'sculpt' a more-perfect plant. Adeniums make good subjects for bonzai-type training which causes relatively young plants appear old and weathered (and with beautiful flowers!). NOTE: The sap/juice of Adeniums is toxic and irritating. When pruning your plant, it is best to wear rubber gloves and wash both gloves and pruning tools immediately after use with soapy water. Adenium leaves, although toxic, are also extremely bitter and animals are repelled by them after the first slight taste. Aphids (common), mealy bugs, and mites, are pests which you might encounter. Published by The Cactus File, Cirio Publishing Services Ltd., UK; 80 pp.